Speaking of Rev25, Chain of Strength, who are scheduled to play two nights of the celebration, have added a late show THURSDAY (10/11) at Acheron (!) 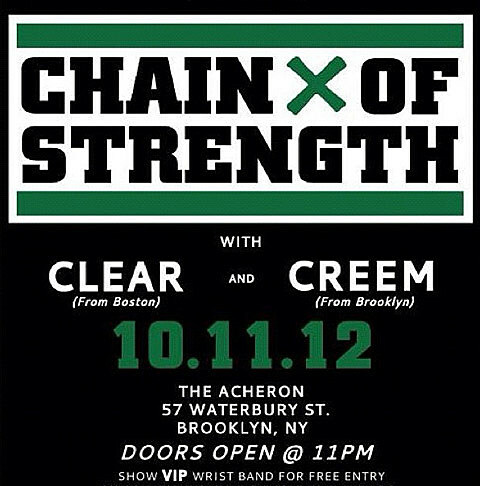 with Clear (ex Have Heart) and Brooklyn’s own Creem. There will be very limited tickets at the door for civilians, with many of the tickets allocated to VIP wristbands for the Revelation Records attendees. Get there early! It should be nuts. In other Revelation-extracirricular activites news, On the Might of Princes at Saint Vitus on Friday (10/12) is waaaay sold out, but luckily the band will play the venue TONIGHT (10/10) as well, part of a bill with Gameface, Descender, Model Home. The show is FREE and 21+. The show also promises “another possible special guest”… could it be Texas is the Reason (who have a sold-out show at MHoW tonight)? Saint Vitus will also host the sold-out Into Another show on 10/13.